That's just because the same voices speak to me too, Ed! I dunno, I think that Minnesota's dialect sounds more foreign than anything a Brit ever said! I'll buy that... Haven't been to some of the more central areas of PA, have ya, bro? I got to admit, a girl with an English accent, man she scores some high points right there. Haven't been to some of the more central areas of PA, have ya, bro? Oh yeah I sure have...all too familar with that phenomenon. I like how here in the States whenever some shuckster has something to sell on an informercial they get a British gal or guy to do the talking. Because they know that us dumb Yanks assume that anyone with a British accent is an intellectual who knows what they are talking about. Yup! Back when the Victoria's Secret catalog first came out -- before they used supermodels and had stores everywhere -- they had "Victoria's Secret, London" as the return address on their catalogs (they were in Ohio) and had a good but fake British woman's voice on their phone line. I should add that in our case, our resident Brit does indeed know what he's talking about, and that I value his knowledge very highly! Of course I'm only saying that because he's making me buy my own drinks next month! Aye he sez that now, but after round one he'll soften up when he sees what a darlin' ye are, and you'll drink the rest o' the night for free! Well, one can only hope! See, I told ya there was a purpose for them. I have absolutely no idea what we are talkin about now. Hee hee hee! You weren't trying to follow my train of thought, were you Petee? Should have warned you: that way lies madness! The quick story: I'm going to England next month to the Reenactors' Market. My husband does ECW and wants a pair of Bucket Boots made by this amazing historical shoemaker, Sarah Juniper. If he's talking to her, he'll be so entranced that Ed could probably buy me drinks for three days before he'd notice I was gone. Of course this means I'd have to let him buy Bucket Boots! Oh just don't let those boots fall into the wrong hands Kass! Keep them in squarely in events where people see them and say "Oh those are FINE ECW Boots", not "Hey NICE pirate boots! Arrg matey! Ahoy!" Wha? Did I just fall for something? Did I miss the joke...or is it on me? If you did, so did I, Josh! And remember: filthy, rich, American company that's buying the drinks! A man might not have a horse, but he'd have bucket boots and "pretend". And thanks fer the hanky!! So, no, they probably didn't go ashore in slops and shirt, but they probably didn't wear that at sea much either. There's a bit in Henry Teonge's diary where his ship is sailing off the North African coast in the middle of summer - one of the hottest and most oppresive atmospheres in the world - and one day he notes that the seamen "put off" their jackets. Even in that climate it was news that the men were in their shirt sleeves. 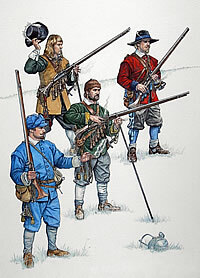 What differentiated them from the landsmen was that they wore wide open slops instead of breeches and short jackets instead of long coats, floppy hats or thrum caps instead of large tricorns etc. Okay - now yer gonna make my head explode again! Did you not say in the beginning that they didn't wear slops much, and then that they wore slops instead of breeches? Is there a time-frame diff here, or do I have Peteeitis and I'm just reading something wrong? So - GAoP attire consisted of: a hat, shirt, jacket (with or without waistcoat), neck-cloth, breeches or trousers, stockings, and shoes. Is that 'jacket' short, or more like a justaucorps? And Buccaneer era attire consisted of: a hat and doublet (instead of waistcoat?) and breeches (loose or tight legged?) and boots - or another type of shoe (WHAT kind of shoe if not boots?) No coat for this period??? I think I must have read about that Nelsonian incident too. I was using "breeches" figuratively to mean anything which covered the top half of the legs - breeches proper, slops, petticoat breeches etc. Jackets were, for the most part, short amongst seamen. Seamen 1640s. Note a mix of jackets and doublets. One guy has a doublet on its own, another has one under his jacket. 1660s-90s. This guy is actually a sea-gunner, but it gives a good impression of post-Restoration military and civilian dress. Typical "pig-hunter" buccaneers. Long shirts, leggings, short jackets, no breeches. The "buccaneer" period really lasted something like 80 years (though there was a 20 year high point between about 1670 and 90) so fashions changed quite a bit, and different parts of society had their own fashions. Despite the radical differences, all of the above oufits would be suitable for buccaneering.